"Flatfoot" redirects here. For other uses, see Flatfoot (disambiguation). There is a functional relationship between the structure of the arch of the foot and the biomechanics of the lower leg. The arch provides an elastic, springy connection between the forefoot and the hind foot so that a majority of the forces incurred during weight bearing of the foot can be dissipated before the force reaches the long bones of the leg and thigh. In pes planus, the head of the talus bone is displaced medially and distal from the navicular bone. As a result, the Plantar calcaneonavicular ligament (spring ligament) and the tendon of the tibialis posterior muscle are stretched, so much so that the individual with pes planus loses the function of the medial longitudinal arch (MLA). If the MLA is absent or nonfunctional in both the seated and standing positions, the individual has “rigid” flatfoot. If the MLA is present and functional while the individual is sitting or standing up on their toes, but this arch disappears when assuming a foot-flat stance, the individual has “supple” flatfoot. This latter condition is often treated with arch supports. However, a recent randomized controlled trial found no evidence for the efficacy of treatment of flat feet in children either from expensive prescribed orthotics (i.e., shoe inserts) or less expensive over-the-counter orthotics. Three studies (see citations below in Military performance section) of military recruits have shown no evidence of later increased injury, or foot problems, due to flat feet, in a population of people who reach military service age without prior foot problems. However, these studies cannot be used to judge possible future damage from this condition when diagnosed at younger ages. They also cannot be applied to persons whose flat feet are associated with foot symptoms, or certain symptoms in other parts of the body (such as the leg or back) possibly referable to the foot. Flat feet of a child are usually expected to develop into high or proper arches, as shown by feet of the mother. Studies have shown children and adolescents with flat feet are a common occurrence. The human arch develops in infancy and early childhood as part of normal muscle, tendon, ligament and bone growth. Flat arches in children usually become high arches as the child progresses through adolescence and into adulthood. Children with flat feet are at a higher risk of developing knee, hip, and back pain. A recent randomized controlled trial found no evidence for the efficacy of treatment of flat feet in children either from expensive prescribed orthotics i.e (shoe inserts) or less expensive over-the-counter orthotics. As a symptom itself, flat feet usually accompany genetic musculoskeletal conditions such as dyspraxia, ligamentous laxity or hypermobility. Since children are unlikely to suspect or identify flat feet on their own, it is important for adult caregivers to check on this themselves. Besides visual inspection of feet and of the treadwear pattern on shoe soles, caregivers should notice when a child's gait is abnormal or the child seems to be in pain from walking. Children who complain about calf muscle pains, arch pain, or any other pains around the foot area may be developing or have developed flat feet. Lateral X-ray of a flat foot with C-sign, which is a bony bridge between the talar dome and sustentaculum tali, in combination with a prominent inferior border of the sustentaculum tali. This represents a talocalcaneal coalition, which is an abnormal connection between the talus and calcaneus, and is thought to cause the flat foot deformity in this case. Training of the feet, utilizing foot gymnastics and going barefoot on varying terrain, can facilitate the formation of arches during childhood, with a developed arch occurring for most by the age of four to six years. Ligament laxity is also among the factors known to be associated with flat feet. One medical study in India with a large sample size of children who had grown up wearing shoes and others going barefoot found that the longitudinal arches of the bare-footers were generally strongest and highest as a group, and that flat feet were less common in children who had grown up wearing sandals or slippers than among those who had worn closed-toe shoes. Focusing on the influence of footwear on the prevalence of pes planus, the cross-sectional study performed on children noted that wearing shoes throughout early childhood can be detrimental to the development of a normal or a high medial longitudinal arch. The vulnerability for flat foot among shoe-wearing children increases if the child has an associated ligament laxity condition. The results of the study suggest that children be encouraged to play barefooted on various surfaces of terrain and that slippers and sandals are less harmful compared to closed-toe shoes. It appeared that closed-toe shoes greatly inhibited the development of the arch of the foot more so than slippers or sandals. This conclusion may be a result of the notion that intrinsic muscle activity of the arch is required to prevent slippers and sandals from falling off the child’s foot. In children with few symptoms orthotics are not recommended. Flat feet can also develop as an adult ("adult acquired flatfoot") due to injury, illness, unusual or prolonged stress to the foot, faulty biomechanics, or as part of the normal aging process. This is most common in women over 40 years of age. Known risk factors include obesity, hypertension and diabetes. Flat feet can also occur in pregnant women as a result of temporary changes, due to increased elastin (elasticity) during pregnancy. However, if developed by adulthood, flat feet generally remain flat permanently. A woman in her thirties dorsiflexes, showing an absence of arches, over-pronated navicular and hallux valgus in the toes typically associated with flat feet. Flatfoot in a 55-year-old female with ankle and knee arthritis. If a youth or adult appears flatfooted while standing in a full weight bearing position, but an arch appears when the person plantarflexes, or pulls the toes back with the rest of the foot flat on the floor, this condition is called flexible flatfoot. This is not a true collapsed arch, as the medial longitudinal arch is still present and the windlass mechanism still operates; this presentation is actually due to excessive pronation of the foot (rolling inwards), although the term 'flat foot' is still applicable as it is a somewhat generic term. Muscular training of the feet is helpful and will often result in increased arch height regardless of age. Research has shown that tendon specimens from people who suffer from adult acquired flat feet show evidence of increased activity of proteolytic enzymes. These enzymes can break down the constituents of the involved tendons and cause the foot arch to fall. In the future, these enzymes may become targets for new drug therapies. Many medical professionals can diagnose a flat foot by examining the patient standing or just looking at them. On going up onto tip toe the deformity will correct when this is a flexible flat foot in a child with lax joints. Such correction is not seen in adults with a rigid flat foot. An easy and traditional home diagnosis is the "wet footprint" test, performed by wetting the feet in water and then standing on a smooth, level surface such as smooth concrete or thin cardboard or heavy paper. Usually, the more the sole of the foot that makes contact (leaves a footprint), the flatter the foot. In more extreme cases, known as a kinked flatfoot, the entire inner edge of the footprint may actually bulge outward, where in a normal to high arch this part of the sole of the foot does not make contact with the ground at all. 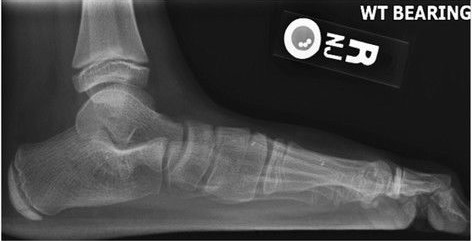 On plain radiography, flat feet can be diagnosed and graded by several measures, the most important in adults being the talonavicular coverage angle, the calcaneal pitch, and the talar-1st metatarsal angle (Meary's angle). 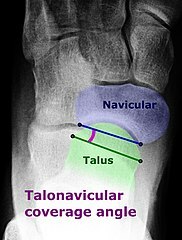 The talonavicular coverage angle is abnormally laterally rotated in flat feet. It is normally up to 7 degrees laterally rotated, so a greater rotation indicates flat feet. Radiographies generally need to be taken on weightbearing feet in order to detect misalignment. Dorsoplantar projectional radiograph of the foot showing the measurement of the talonavicular coverage angle. Weight-bearing lateral X-ray showing the measurement of calcaneal pitch, which is an angle of the calcaneus and the inferior aspect of the foot, with different sources giving different reference points. A calcaneal pitch of less than 17° or 18° indicates flat feet. Same lateral X-ray showing the measurement of Meary's angle, which is the angle between the long axis of the talus and first metatarsal bone. An angle greater than 4° convex downward is considered a flat foot, 15° - 30° moderate flat foot, and greater than 30° severe flat foot. Most flexible flat feet are asymptomatic, and do not cause pain. In these cases, there is usually no cause for concern. Flat feet were formerly a physical-health reason for service-rejection in many militaries. However, three military studies on asymptomatic adults (see section below), suggest that persons with asymptomatic flat feet are at least as tolerant of foot stress as the population with various grades of arch. Asymptomatic flat feet are no longer a service disqualification in the U.S. military, but symptomatic flat feet are cause for disqualification during the enlistment process. In a study performed to analyze the activation of the tibialis posterior muscle in adults with pes planus, it was noted that the tendon of this muscle may be dysfunctional and lead to disabling weightbearing symptoms associated with acquired flat foot deformity. The results of the study indicated that while barefoot, subjects activated additional lower-leg muscles to complete an exercise that resisted foot adduction. However, when the same subjects performed the exercise while wearing arch supporting orthotics and shoes, the tibialis posterior was selectively activated. Such discoveries suggest that the use of shoes with properly fitting, arch-supporting orthotics will enhance selective activation of the tibialis posterior muscle thus, acting as an adequate treatment for the undesirable symptoms of pes planus. Rigid flatfoot, a condition where the sole of the foot is rigidly flat even when a person is not standing, often indicates a significant problem in the bones of the affected feet, and can cause pain in about a quarter of those affected. Other flatfoot-related conditions, such as various forms of tarsal coalition (two or more bones in the midfoot or hindfoot abnormally joined) or an accessory navicular (extra bone on the inner side of the foot) should be treated promptly, usually by the very early teen years, before a child's bone structure firms up permanently as a young adult. Both tarsal coalition and an accessory navicular can be confirmed by X-ray. Rheumatoid arthritis can destroy tendons in the foot (or both feet) which can cause this condition, and untreated can result in deformity and early onset of osteoarthritis of the joint. Such a condition can cause severe pain and considerably reduced ability to walk, even with orthoses. Ankle fusion is usually recommended. Treatment of flat feet may also be appropriate if there is associated foot or lower leg pain, or if the condition affects the knees or the lower back. Treatment may include foot gymnastics or other exercises as recommended by a podiatrist or physical therapist. In cases of severe flat feet, orthoses should be used through a gradual process to lessen discomfort. Over several weeks, slightly more material is added to the orthosis to raise the arch. These small changes allow the foot structure to adjust gradually, as well as giving the patient time to acclimatise to the sensation of wearing orthoses. In some cases, surgery can provide lasting relief, and even create an arch where none existed before; it should be considered a last resort, as it is usually very time consuming and costly. A minimally-invasive surgical intervention involving a small implant is also available. The implant is inserted into the sinus tarsi and prevents the calcaneus and talus from sliding relative to each other. This prevents the sinus tarsi from collapsing and thus prevents the external symptom of the fallen arch from occurring. Acquired Flat foot deformity with clinical soft tissue swelling. The effects of flat feet fall under two categories, which are asymptomatic and symptomatic. Individuals with rigid flat feet tend to exhibit symptoms such as foot and knee tendinitis, and are recommended to consider surgical options when managing symptoms. Individuals with flexible flat generally exhibit asymptomatic effects in response to their flat feet. According to AAP news and journal gateway, being flexibly flat-footed does not impede athletic performance. It is generally assumed by running professionals (primarily including some physical trainers, podiatrists, and shoe manufacturers) that a person with flat feet tends to overpronate in the running form. However, some also assert that persons with flat feet may have an underpronating if they are not a neutral gait. With standard running shoes, these professionals claim, a person who overpronates in his or her running form may be more susceptible to shin splints, back problems, and tendonitis in the knee. [dubious – discuss] Running in shoes with extra medial support or using special shoe inserts, orthoses, may help correct one's running form by reducing pronation and may reduce risk of injury. Studies analyzing the correlation between flat feet and physical injuries in soldiers have been inconclusive, but none suggests that flat feet are an impediment, at least in soldiers who reached the age of military recruitment without prior foot problems. Instead, in this population, there is a suggestion of more injury in high arched feet. A 2005 study of Royal Australian Air Force recruits that tracked the recruits over the course of their basic training found that neither flat feet nor high arched feet had any impact on physical functioning, injury rates or foot health. If anything, there was a tendency for those with flat feet to have fewer injuries. Another study of 295 Israel Defense Forces recruits found that those with high arches suffered almost four times as many stress fractures as those with the lowest arches. A later study of 449 U.S. Navy special warfare trainees found no significant difference in the incidence of stress fractures among sailors and Marines with different arch heights. ^ "Common foot and ankle conditions". physiciansfootcare.com. Retrieved 2019-02-23. ^ a b Franco, Abby Herzog (1987). "Pes Cavus and Pes Planus Analyses and Treatment". Physical Therapy. 67 (5): 688–94. PMID 3575426. ^ Whitford D.; Esterman A. (2007). "A randomized controlled trial of two types of in-shoe orthoses in children with flexible excess pronation of the feet". Foot and Ankle International. University of South Australia, Spencer Gulf Rural Health School. 28 (6): 715–23. doi:10.3113/FAI.2007.0715. PMID 17592702. ^ a b Harris, Edwin J. "The Natural History and Pathophysiology of Flexible Flatfoot". Clinics in Podiatric Medicine and Surgery. 27 (1): 1–23. doi:10.1016/j.cpm.2009.09.002. ^ "Dyspraxia in Adults". 3 October 2013. ^ "Five Things Physicians and Patients Should Question" (PDF). Choosing Wisely. Retrieved 15 February 2018. ^ a b "Advance toward treatment for painful flat feet". ScienceDaily. 2012-01-11. ^ Dan J Bell and Yuranga Weerakkody. "Pes planus". Radiopaedia. Retrieved 2018-03-01. ^ Detailed explanations and references are located in the Calcaneal pitch article. ^ Kulig, Kornelia; et al. (2005). "Effect of foot orthoses on tibialis posterior activation in persons with pes planus". Med Sci Sports Exerc. 37 (1): 24–29. doi:10.1249/01.mss.0000150073.30017.46. ^ "Fallen Arch". Health A to Z. Aetna InteliHealth(R). 2007-12-18. Retrieved 2008-05-27. Unlike a flexible flatfoot, a rigid flatfoot is often the result of a significant problem affecting the structure or alignment of the bones that make up the foot's arch. ^ "Flatfoot". Bone, Joint and Muscle Conditions: Flatfoot. Seattle Children's Hospital. 2008-07-29. Retrieved 2008-05-27. About one in four people with rigid flatfoot has pain and disability. ^ "Rheumatoid Arthritis in Feet - Academic Association of Medicine". aaom.org. ^ "Flat Feet – Everything You Should Know – The Shoes For Me". theshoesforme.com. ^ "Can The HyProCure Implant Provide The Answer For Hyperpronation?". podiatrytoday.com. ^ Tudor, Anton; Ruzic, Lana; Sestan, Branko; Sirola, Luka; Prpić, Tomislav (1 March 2009). "Flat-Footedness Is Not a Disadvantage for Athletic Performance in Children Aged 11 to 15 Years". Pediatrics. 123 (3): e386–e392. doi:10.1542/peds.2008-2262. PMID 19254974. ^ "Pronation, Explained." Runner's World. August 2004. ^ Esterman A, Pilotto L (July 2005). "Foot shape and its effect on functioning in Royal Australian Air Force recruits. Part 1: Prospective cohort study". Military Medicine. 170 (6): 623–28. PMID 16130646. ^ Giladi M, Milgrom C, Stein M, et al. "The low arch, a protective factor in stress fractures: a prospective study of 295 military recruits". Orthop Rev 1985; 14:82–84. ^ Jones, Bruce H.; Thacker, Stephen B.; Gilchrist, Julie; Kimsey, Jr., C. Dexter; Sosin, Daniel (2002). "Prevention of Lower Extremity Stress Fractures in Athletes and Soldiers: A Systematic Review". Epidemiologic Reviews. 24 (2): 228–47. doi:10.1093/epirev/mxf011. PMID 12762095.